-The future - what are the next steps? The cost of wind energy generation has fallen dramatically since the introduction of commercial wind turbines in the 1980s, largely through innovation and technology development. But in many cases, we have still not reached grid parity, when it can produce electricity at the same price as traditional technologies. Historically, gearboxes and main bearings have been a headache for wind farm operators and owners. They have failed to meet service expectations within such a dynamic operating environment. So how do your main bearings measure up? Is your bearing system reliable? How can you reduce costs without compromising reliability? In this live Windpower Monthly webcast, we take a detailed look at the material issues and the true wear and tear of bearings. Don’t miss this opportunity to hear our expert speakers discuss how software and services can help you increase drivetrain performance, increase reliability, reduce costs and solve existing issues. Romax Technology is a global leader in providing consulting, engineering and software solutions for end-to-end driveline, bearings and gearboxes across the wind energy, automotive, aerospace, rail, off road, marine and bearings industries. Ahead of RenewableUK Global Offshore Wind 2014 in Glasgow next month, Windpower TV brings you an exclusive preview webcast featuring leading figures in the wind industry. Ahead of EWEA 2014 in Barcelona next month, Windpower TV brings you an exclusive preview webcast featuring leading figures in the wind industry. While some 2030 renewable energy targets across the EU are in disarray, wind energy industry companies cannot put business on hold. With early signs of the end of the decline in economic conditions, they must plan for the future now. So what are they doing to get back to business? - how has the company adapted to survive in Europe during the economic downturn? - What lessons have been learned that can continue to be used? - What regions are now being considered? - How are they dealing with local content requirements? 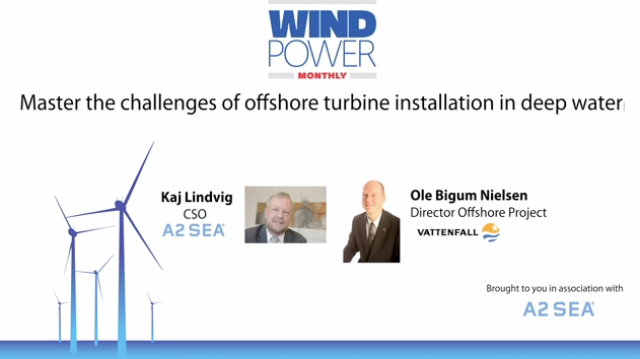 Ahead of EWEA Offshore 2013 in Frankfurt next month, Windpower TV brings you an exclusive preview webcast featuring leading figures in the wind industry. Offshore wind brings with it a capital outlay of over £1bn for large-scale developments* and high ongoing maintenance costs. Which begs the question: should we push for more offshore growth to fast-track the economies of scale, or is it more financially responsible to take a different path? - How does offshore wind compare to the cost of other forms of energy? Is the differential as high as some media reports would have us believe? - What are the other factors at play here? How do we put a value on job creation and environmental benefits? - What will be the major factors that will bring down the costs of offshore wind and when will they come into play? - How do the alternative energy forms compare if we are to meet the EU’s 2020 and 2050 targets? Testing the turbines that will make up the backbone of offshore round three has begun in earnest. The scale of these machines, such as the Samsung 7MW prototype*, only works to highlight the engineering and logistical challenge surrounding installing and maintaining these machines far out to sea. Many are voicing concerns around the lack of O&M capacity in the offshore fleet, and the need to reduce the cost of energy faster than currently, but what are the other challenges receiving less attention? · Trends in the offshore market: Deeper waters and further offshore. · State of the art vessel design: How fit for purpose specialised vessels are impacting cost of energy. This webcast is essential viewing for anyone with a vested interest in the offshore wind industry now, or in the coming years. o Turbine and foundation concepts for R3: which concepts are emerging as winners and why? o How is the industry planning for cables and grid infrastructure for far from shore wind farms? o What are the unresolved issues and requirements and how can we move them forward? Preview webinar for the upcoming Windpower Monthly Low Wind Forum taking place on October 30th & 31st - to find out more head to: www.lowwindforum.com. High-wind sites available for development onshore are becoming fewer and as a result developers must look to low-wind sites (IEC II & III) instead. The viability of these sites depends on the ability to maximise energy yields for optimum ROI. This webinar will give a snapshot of some of the leading issues which affect the commercial outlook of the low wind sector and the development potential of low-wind sites across Europe. - What are the criticalities in selecting a low-wind site? For players in the onshore wind industry, this webcast will provide a valuable introduction to understanding the economic potential of low-wind sites in the future. The future of wind power lies offshore, certainly if global targets for renewables have any chance of being met. Absolutely key to development of the industry is reduction in cost of energy. A primary focus of RenewableUK Offshore 2013 was cost reduction. This webcast looks where everyone involved in offshore wind should turn their focus now. *Alastair Dutton, Programme Manager (Wind Development), The Crown Estate discussing the work of the offshore programme board to bring down down the cost of energy to £100/MWh by 2020. 2013 is set to be a defining year for wind power. The turbulence of 2012 will undoubtedly continue, but there are huge opportunities for anyone innovative enough to take advantage of them. Tune into Windpower Monthly TV’s exclusive EWEA Preview Webcast, where leading speakers from the conference will whet your appetite for the main event. Christian Kjaer: CEO - EWEA, Peder Nickelsen: Head of Product Lifecycle Management - Siemens Wind Power , and Tom Murley: Head of Renewables at HG Capital offer their expert advice on where you should be focussed in the coming year and share invaluable insights into the growing potential of Europe’s emerging wind energy markets. * Industry oveview from Christian Kjaer: CEO - EWEA: What’s happening in wind? * Finance: Who’s funding new wind projects in 2013? * Technology: Siemens predict trends in future key turbine advancements. Viewing is essential for all renewable energy professionals wanting to get a head start over the competition. - Best practices for working at height in high wind: How to ensure technicians’ safety during blade and tower maintenance. - Blades can be particularly difficult to access effectively. Case study: How to access the blade safely, reliably and cost-effectively. - Remote turbines have much higher accident rates and take far longer to service, as specialist equipment is often not held on site: What should be done in this case? Does wind power have a part to play in meeting the UK’s legally binding environmental targets, or is it just too expensive? This heated webcast will get to the bottom of the issues raised by the controversial AF Consult report, and the Sunday Times article published as a result. - Nuclear vs. offshore wind. What do different power sources actually cost? - Importing gas and uranium. Is the value of energy security appropriately weighted? - Neglecting Brussels. What are the legal implications of ignoring EU renewable energy targets? -What is wind farm design all about? -What next for wind farm design? Windpower Monthly have launched their new webcast offering to feature the leading speakers in the marketplace on an international stage covering your key issues and challenges. Sign up to this channel to receive groundbreaking insights into the hottest issues within the Wind industry. You can also take part in our votes, put your questions to our live experts and submit your feedback.